Naturally colored diamond crystals are an organic and one-of-a-kind alternative to polished and cut white diamonds. Stand out from other brides with a custom raw or rose cut diamond engagement ring! They have been used in jewelry throughout history, and are also a great choice for men's rings. Natural raw diamonds come in a variety of natural, fancy colors and shapes as you can see on this page. The most popular of the alternative cut diamonds are the white diamonds, cut in a vintage style called "rose-cut." These diamonds are shallower than a round brilliant, so they can be quite cost effective for a large diameter. They evoke the feeling of an antique style, and most of our engagement ring designs can be converted to accomodate a white rose cut diamond! The most popular of the rustic diamonds are the rose cut, opaque fancy colored diamonds. These can be set just like a cabochon, either with prongs or a full bezel. Many engagement ring designs can be converted to accomodate a rose cut opaque diamond! Request a Special Rose Cut Diamond! Diamond slices are available in lots of different colors and sizes. Each one is completely unique! Some are more transparent than others. The face of the diamond slice can have just a few large facets, or it might be covered in small, checkerboard type facets. We like the more faceted of the slices; it give the diamond some a nice sparkle! We can create custom rings with a diamond slice! 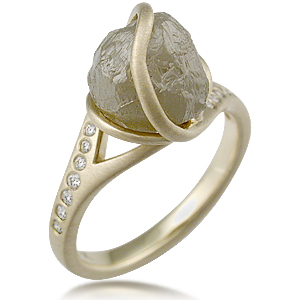 Raw diamonds come in irregular shapes, like the rough spheres in our Diamond Orbit Engagement Ring. These diamond "ballas," as they are called, are found naturally in that shape, but they come in all sorts of colors! The surface of a rough sphere can be a soft matte, like the image on the left, or a sparkly, glass like surface, such as seen on the ring to the right. Interested in a raw diamond ballas for an engagement ring? Request a Raw Diamond Ball! Can you believe that diamonds are found in spheres and also cubes? What an amazing stone! Natural rough diamond cube. The one shown on the left is a 8.60 carat cube from Canada! Interested in a cube for an engagement ring? Request a raw diamond cube! 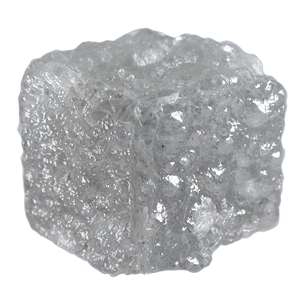 A natural rough diamond macle is a flat triangular-shaped crystal. It grows naturally in this shape, when the diamond grows in a double crystal. Diamond macles are naturally triangular! They are typically left unfaceted, and set in their natural form. This is a unique choice for a men's wedding band, for a little bling without all the sparkle. 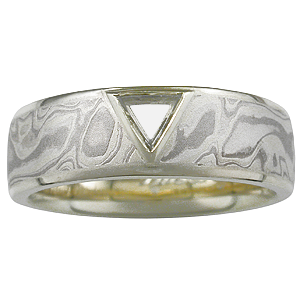 It's shown here in this Winter mokume gane wedding band. Thinking of a macle for a wedding or engagement ring? Request a raw diamond macle!